A former U.S. Marine is pleading with military officials to release her ailing canine partner into her care. Former Sgt. 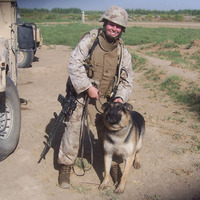 Megan Leavey served two six-month tours of duty in Iraq with Sgt. Rex, a U.S. Military Working Dog. The pair worked together closely as a bomb detection team. In 2006, Leavey and Rex, a German Shepherd, were severely injured when an improvised explosive device detonated. Leavey was knocked unconscious by the blast. “I remember waking up and pulling my leash and thinking, ‘Oh my God, please be something on the other end of this leash,” Leavey said. Miraculously, both Leavey and Sergeant Rex managed to survive. After finishing a year of rehabilitative care to treat the injuries they incurred together, Leavey and Rex were separated. Leavey, a recipient of the Purple Heart for her work in Iraq, went home to upstate New York. Rex was sent across the country, where he continued to serve at Camp Pendleton, CA. Since her discharge in December 2007, Leavey has been actively seeking to adopt Sergeant Rex, a dog that not only saved her life and the lives of countless others, but a dog that she misses every day. The red tape she has encountered in her struggle to adopt Sergeant Rex is all the more frustrating because Rex’s time is running out. Rex will turn 11 next month, and has been diagnosed facial palsy. Rex is unable to serve at the Camp Pendleton base because of this nerve condition. Leavey has reached out to Sen. Charles Schumer (D-NY) in an effort to adopt her former comrade and friend. Senator Schumer has thrown his support behind Leavey, urging the military to put a rush on the adoption. “They deserve to be reunited after risking their lives to make sure our troops stayed as safe as possible when traveling roads littered with IEDs,” Schumer stated. As of this past weekend, officials announced that an adoption is pending, but there is no telling how long the process could take. “The Marines don’t have a reason against uniting them. It’s just a slow bureaucracy,” Schumer said. In the meantime, Corporal Leavey is waiting for word, anxious and hopeful for the day she can see her partner, friend, and hero again. And for Sergeant Rex’s sake, let’s hope that day is soon.